I had the honour of working for the Sony Corporation in the UK from 1988 - 98. I was managing director of the Consumer business throughout that period and also gained additional responsibilities in Europe and later for the whole of the United Kingdom business. I met Mr. Morita on a number of occasions and always found it truly inspirational. Early on in my time in 1991 he gave the inaugural Innovation Lecture at the Royal Society in London. The event was organised by the British Government Department for Trade and Industry and I found it amazing that Mr. Morita was the first person invited to give the speech. The audience had many leading scientists including several Nobel Prize winners but Morita-san soon had them eating out of his hand. He started by saying how much he admired the British. We were the nation that gave the world Newton and Faraday and so much more. However he had one question. Why did we allow our accountants to run our public companies? The audience roared with laughter and even the few accountants in the room had to smile because of the charming way in which Mr. Morita made his point. 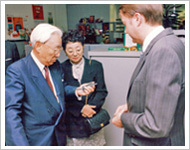 In 1993, Mr. Morita was awarded with an honorary knighthood by Her Majesty Queen Elizabeth II. 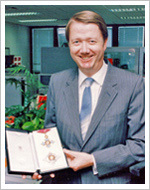 He was made a Knight Commander of the Most Excellent Order of the British Empire (KBE). This is a very rare event for someone who is not born a British citizen and only two other Japanese nationals have received this honour. He went round all the British sites to show the Sony members the insignia which he said was all our achievement. He even let me hold it and I have a photograph of me with the insignia which is as near to such an honour as I can ever expect to get! His humility when receiving such a great honour was profoundly moving. On the same occasion I showed him the CM-R111, our latest entry into the mobile telephone market. Today we are all familiar with tiny mobile phones but then to have such a small phone was really a breakthrough. It must have reminded Mr. Morita of the early Sony pocket radios and the first Sony Walkman.